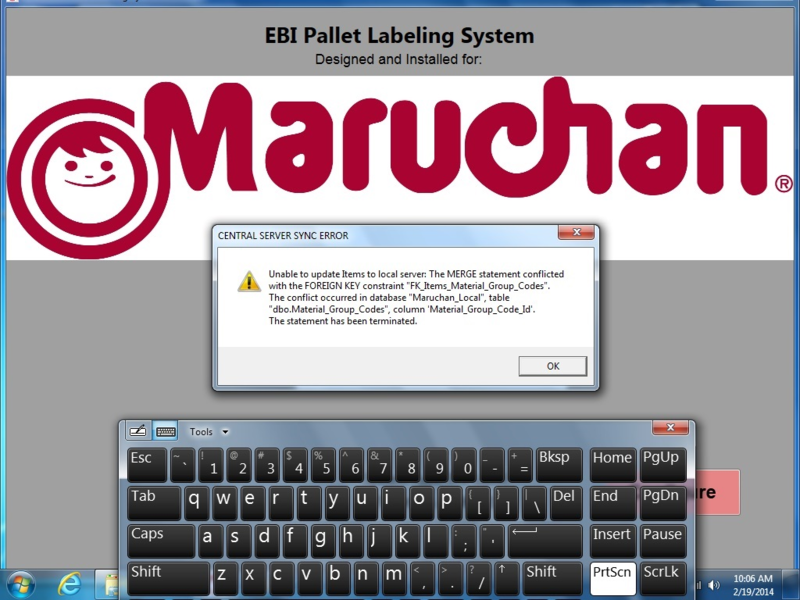 This Error Message Article explains the Maruchan EBI Pallet Label System error message “Unable to update Items to the local server: The MERGE statement conflicted with the FOREIGN KEY constraint” and details how to fix the underlying problem that caused it to appear. The SQL statement executed on the local client machine was unable to update the Item table on the Central Server because a foreign key referenced that table was missing in the table referenced by the foreign key (in this case Item_Material_Group_Codes). There is a mismatch of database structure between the local workstation and center server. Verify that the database structures are identical and come from the same EBI Pallet Label System software version.